Quality Assurance Association CO2-neutral Wooden Buildings e.V. To keep the greenhouse effect and the resulting global warming within limits, the Kyoto Protocol requires all countries to reduce their CO2 emissions. CO2 is primarily released when fossil fuels are burned, for which industries, motor vehicles and buildings are primarily responsible. 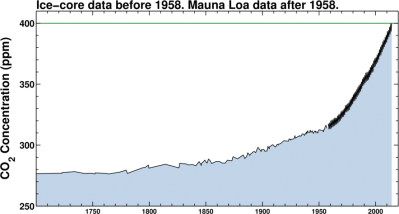 The above graphic clearly shows the increase in CO2 concentrations in the earth's atmosphere over the last 50 years. It is apparent that this tendency will continue at a similar pace for decades to come. 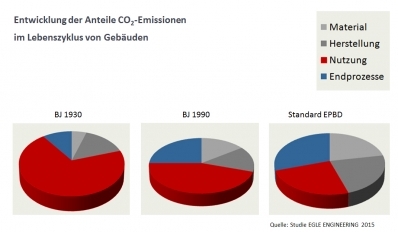 The currently valid German Energy Saving Ordinance “EnEV” (formerly the Thermal Insulation Act) for buildings regulates energy savings during the utilization phase and has made enormous progress in residential housing over the past 30 years and has led to a significant reduction in CO2 emissions. 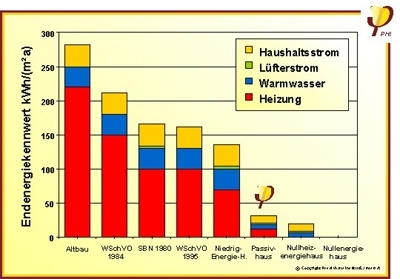 Improved insulation in new buildings has reduced the consumption by 90%. Based on the current status of the Energy Saving Ordinance, further insulation measures do not often lead to additional savings when the production efforts and costs are taken into consideration. If you want to achieve additional savings, the building as a whole has to be examined in which not only the utilization but also the production and the waste disposal have to be included. Enormous amounts of energy, the so-called “grey energy”, have to be applied in the production of construction materials. These facts have been scientifically researched for some time now. At the European level, product declarations, so-called “EPDs” (European Product Declarations) have been developed and standardized for individual materials. These declarations identify the properties of each of the materials. Based on the respective EPD, the entire energy balance for the building of a structure can be recorded. 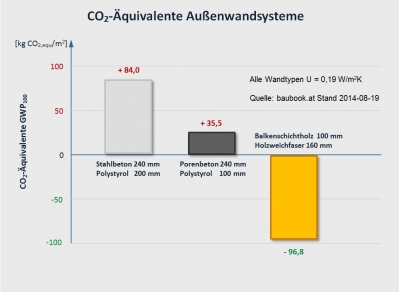 The “Quality Assurance Association CO2-neutral Wooden Buildings” (in German: Gütegemeinschaft CO2 neutrale Bauwerke in Holz) certifies structures that have a GWP (Global Warming Potential) energy balance value of less than zero during the construction phase. That means: a building has to be built with at least a CO2-neutral rating, or even have a Co2 sinking efficiency. 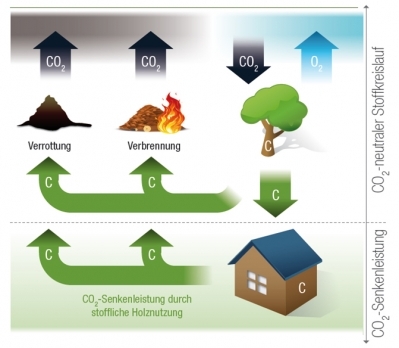 Considering all required materials such as concrete foundations, roof tiles, glass windows, etc., means that, in the case of a solid wood house of approximately 150 m2 living space, the CO2 sinking efficiency would be about 23,000 kg! In comparison, a conventionally built brick house, with all other conditions being the same, has a CO2 environmental impact of 24,000 kg. Wood, as opposed to other materials, is a naturally regenerative raw material - i.e., renewable - and has the unique property of being able to store CO2 while it is growing. Specifically, one ton of wood is able to store almost the same amount of CO2 (0.9 tons)! The CO2-emitting production share of wood as a construction material (transport, drying, processing) is so low that, on the whole, there is significant storage potential as long as the wood continues to exist. Plus, wood can be used in at least one or more other areas of application after it has served its purpose as a building material. Ultimately, it can be burned to produce CO2-neutral heating energy. If you add to the CO2 storage of wood the CO2 value saved from other materials that have been substituted for instead of having to be elaborately manufactured, the potential is again directly doubled. That solid wood houses can last for at least one hundred years is proven by many old houses, many of which are even several hundred years old. Thanks to modern and rational forestry management, the increased use of wood does not lead to a reduction in the forests but to immediate climate relief - not just in 40 to 50 years, as happens with improved building insulation! Only wood that comes from sustainable and certified forestry management can be used for the RAL “CO2-neutral Building” Quality Mark. 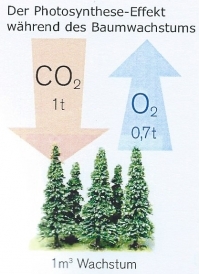 Such a sustainable forest has an even higher CO2-sinking efficiency than a naturally growing primeval forest. This is because in a natural forest the decomposition of the tree and thus the recirculation of CO2 begins immediately after a tree dies. Europe has more than 1,000 million hectares of forest with an annual growth rate of about 510,000 hectares, of which approx. 64 % are cut and used. Thus, the European forests are growing while its natural forests with their ecological structure remain untouched! Summary: the more wood that is cut, and the more trees that are replanted at the same time, the more CO2 that will be stored and, as a result, reduced. The “CO2-neutral Building” Quality Mark monitored and certified by RAL is modularly structured and currently consists of Part A of the EPDs as a component and foundation. As soon as additional, European-recognized and standardized product data all the way through to waste disposal are available, the Quality Mark will be expanded with the same criteria, to allow a holistic approach to be taken into account. The RAL Quality Mark can be applied for and used by all building contractors and lumber construction companies whose structures meet the required criteria. In addition to comprehensive documentation from the manufacturer, the calculation with the EPDs, as well as the independent external monitoring in compliance with the strict criteria of the RAL, which protects the consumer, serve as a foundation. Thus, wooden halls, wooden bridges, etc. can also be appraised and could earn the Quality Mark.